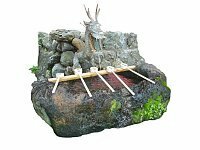 Shinto shrines are places of worship and the dwellings of the kami, the Shinto “gods”. 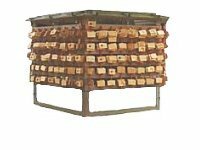 Sacred objects of worship that represent the kami are stored in the innermost chamber of the shrine where they cannot be seen by anybody. People visit shrines in order to pay respect to the kami or to pray for good fortune. Shrines are also visited during special events such as New Year, setsubun, shichigosan and other festivals. New born babies are traditionally brought to a shrine a few weeks after birth, and many couples hold their wedding ceremonies there. Torii One or more torii gates mark the approach and entrance to a shrine. 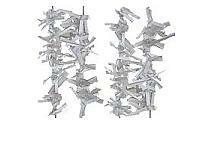 They come in various colors and are made of various materials. 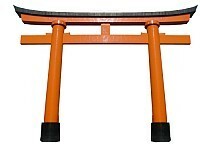 Most torii, however are made of wood, and many are painted orange and black. Komainu are a pair of guardian dogs or lions, often found on each side of a shrine’s entrance. 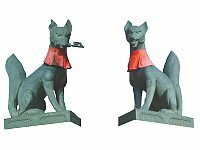 In the case of Inari Shrines, they are foxes (see picture) rather than dogs. Stage for bugaku dance or noh theater performances can be found at some shrines. Ema Shrine visitors write their wishes on these wooden plates and then leave them at the shrine in the hope that their wishes come true. Most people wish for good health, success in business, passing entrance exams, love or wealth. Omikuji Omikuji are fortune telling paper slips found at many shrines andtemples. Randomly drawn, they contain predictions ranging from daikichi (“great good luck”) to daikyo (“great bad luck”). By tying the piece of paper around a tree’s branch, good fortune will come true or bad fortune can be averted. Shimenawa A shimenawa is a straw rope with white zigzag paper strips (shide). 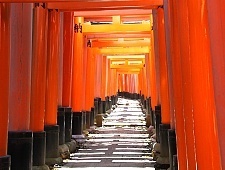 It marks the boundary to something sacred and can be found on torii gates, around sacred trees and stones, etc. 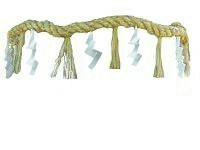 A rope similar to the shimenawa is also worn by yokozuna, the highest ranked sumo wrestlers, during ritual ceremonies. 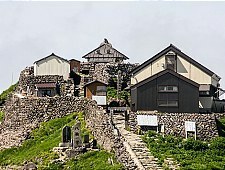 There can be a variety of additional buildings such as the priest’s house and office, a storehouse for mikoshi and other auxiliary buildings. Cemeteries, on the other hand, are almost never found at shrines, because death is considered a cause of impurity in Shinto, and in Japan is dealt with mostly by Buddhism. 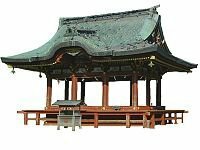 The architecture and features of Shinto shrines and Buddhist temples have melted together over the centuries. There are several construction styles, most of which show (Buddhist) influences from the Asian mainland. 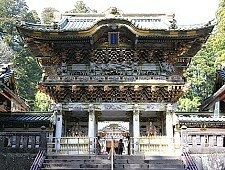 Only a few of today’s shrines are considered to be built in a purely Japanese style. 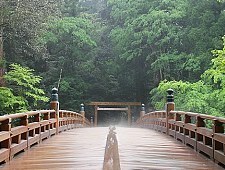 Among them are Shinto’s most important shrines, the Ise Shrines. 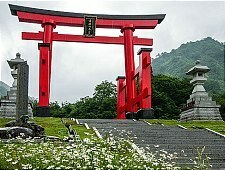 These are the shrines which were directly funded and administered by the government during the era of State Shinto. 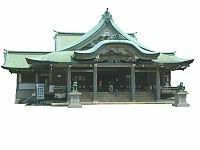 They include many of Shinto’s most important shrines such as the Ise Shrines, Izumo Shrine and Atsuta Shrine, and a number of shrines newly built during the Meiji Period, such as Tokyo’s Meiji Shrine and Kyoto’s Heian Shrine. 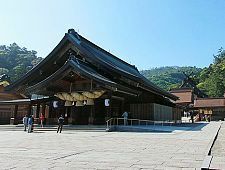 Imperial shrines can be recognized by the imperial family‘s chrysanthemum crest and by the fact that they are often called “jingu” rather than “jinja”. 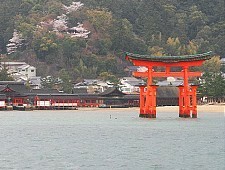 Famous shrine with floating torii gate. The most sacred of the three Dewa Sanzan. Lavish mausoleum of Tokugawa Ieyasu. Japan’s second most important shrine. 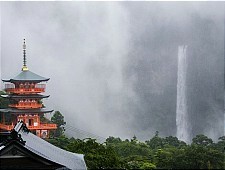 One of the three Kumano shrines. The highest of the three Dewa Sanzan.